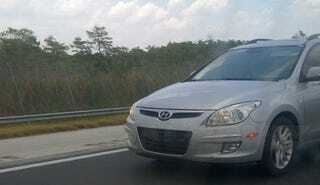 One of our camera-bearing readers managed to snap some photos of a pre-production 2009 Hyundai Elantra Touring making its way down I-75 in Florida. Compared to the Elantra Touring concept version we saw at Chicago, this one seems to have exchanged the orange rectangular indicator on the quarter panel for a clear oval. There are also turn signals integrated into the mirrors, something not found on either the Chicago version or the Beach Cruiser edition.